Note: East Ann Arbor encompassed the area around Packard and Platt roads, which now is part of the city of Ann Arbor. It is the contemporary community that emerged from the historic Malletts Creek Settlement. 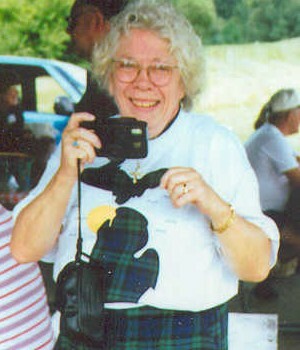 Captions: 1) Mary Cruse, documenting one of the East Ann Arbor reunions. 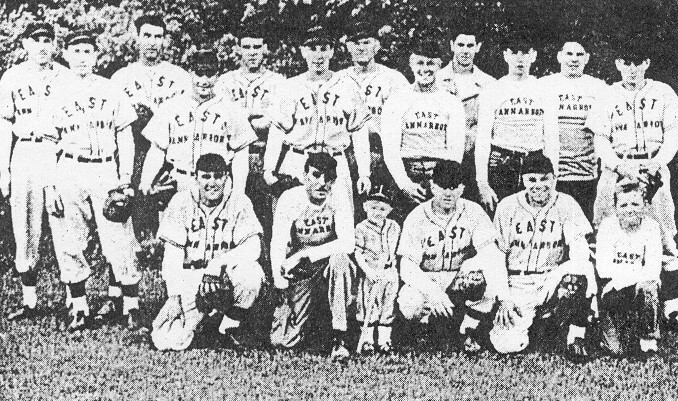 2) The East Ann Arbor baseball team, which was sponsored by George Hines. 3) Educator Mary Mitchell. 4) The East Ann Arbor Fire Department, circa 1950. 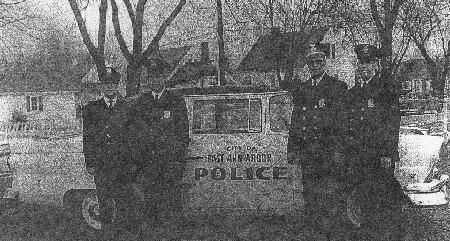 5) The East Ann Arbor Police Department, circa 1950. Four of the five members are shown in this photo. Note: These images are from second-generation photocopies; they will be replaced with higher quality images when original photos can be located. Click photos of the baseball team and/or fire department for larger versions. "Inside the Eastside" is the name I use for the annual newsletter for "East Ann Arbor," which is written the last day of August each year in time for the annual reunion held the first Sunday in September (except on holidays, when it is on the second Sunday). We hold these reunions -- rain or shine -- as it is held at the Old Township Hall Park Pavilion behind the Senior Center Bldg. on the corner of Ellsworth and State Road near the Ann Arbor Airport. In 2002, nearly 100 persons attended. We use the alphabet system for our potluck dishes such as "A through G - Main Dish" and so on with salads and dessert dishes. Plenty of food and many friendships are rekindled after an absence of one year or more. The main source for this group comes from the "Breakfast Club" which meets once a month in the back at Big Boy near Platt Rd. and Washtenaw. Most of these breakfasts are attended by anywhere from twenty to thirty-two persons and ends in "Do you remember when?" From this group I get most of the information for the newsletter. They write on a card for me the most important and perhaps the funniest things which happened during the past year for them and all members of their families; I also use the newspaper and clip out all articles pertaining to this area. A good share of this group were born and raised in this area in the 20s, 30s and 40s. Personally, I was born at a Doctor's Hospital for the newborns in 1926 - then on the corner at E. University and Packard Street, which is now an apartment house. My parents lived on Hill Street and Dad felt that he should move out of the high tax area of Ann Arbor and bought property in the country (Pittsfield Twp.) in 1927. He purchased a parcel of land which originally was part of the Nordman Farm. He built our "Big House" on Nordman Road; he also had property on the corner of Lafayette (New Redwood) and along Springbrook Ave. The "Big House" now seems very small compared to the homes of today. As my brothers and I grew up, we used to run through the fields to one of our friend's homes. All the streets were dirt roads including Milan (Platt) Road and Packard Roads. Platt Road was paved in the 1960s. Packard Road as late as 1955 was still a two-lane road with gravel shoulders and dust from the road settled over everything. There were many farms, large and small, including the Campbell farm on Platt Road, the Platt farm, the Nordman farm, the Swift farm, the Ticknor farm (now Cobblestone Farm), the Klager farm, the large Darling Dairy farm, all on Packard Road. Most of these farms were gone by the time I was a youngster. The farms that I related to the most were the Campbell Farm on Platt Rd. and the Klager Farm on Packard Road. Andrew Campbell let us play in his hay loft as long as we did not damage anything in the barn. He also would take us on hay rides further out in the country (Pittsfield Twp. ); this we enjoyed and it gave us a very close friendship with some of the others on the many trips that were made. He also let us skate on his property and swim in the gravel pit on the southwest corner of Platt Road and Ellsworth Roads which Andy Campbell owned -- now part of the City Landfill. There were three gravel pits in that area, the one mentioned above, another on the southeast comer of Platt and Ellsworth which is now the beautiful Robert A. Lillie Park consisting of over 124 acres of parkland. Today, there are three lakes on this latter property, wetlands, woods, bridges, playground equipment, tennis courts, picnic tables, and gazebos. From this you can see it is a well-equipped park. On the Northwest corner behind the Campbell Home was Zahn's Gravel Pit, which is now part of the Southwest Area Park (Ann Arbor). It is also part of 1-94 as the highway winds its way around this part of Pittsfield Twp. and the City of Ann Arbor. At that time, the era of the Campbell Farm already had passed -- along with its animals, its barns, etc., but the area left us with many memories. I have other memories of that farm. I can still see my Dad swinging a covered milk pail, going down the street to the farm and getting milk for us to drink. When I would go with him, I would sneak out to the barn and watch the cows being milked by hand; later electric milking machines were used. This farm will always be a part of the history of this area. Whenever anyone asks me where I live it's always in "The cow pasture at Klager's Farm" off Platt Road -- now known as Concord Village. This area has a lot of history, which most people do not now remember. The Potawatomi Indians originally inhabited this area and gave up their title in the Treaty of Detroit in 1807. On 1 April 1825, Samuel and Charlotte McDowell and another couple, Oliver and Sarah Whitmore, received land patents for land purchased in the wilderness just east of what is now Platt and Packard roads. Also in 1825 the first school in Washtenaw County was held under an oak tree several rods east of the later Platt School. That first school was in session during the summer months only. In the fall of 1825 a log schoolhouse (Mallett Creek School) was built and was located southeast of Platt and Packard. The settlement was called Mallett Creek settlement and the school existed from 1825 until 1853. Subsequently two other schools came into existence in this area. Children living west of Platt Road went to Stone school and those living east of Platt Road went to Carpenter School; both schools are still in existence today but not their original buildings. Samuel McDowell built a log cabin house around 1836, which still stands. This is one of the oldest homes remaining in Ann Arbor and certainly one of the oldest home in Pittsfield Township. Before the Darling Farm was subdivided in the 1920s, the McDowell house originally faced Packard; then it was rotated and now faces Bellwood. I had the privilege to meet the couple living in the house although its history is not known to the average person walking by it. The house is tucked behind trees and bushes; you can still see some of the original construction of the house when it was built. In 1900 Ulysses G. Darling built what is now known as the second oldest home in Southeast Ann Arbor, which is still standing on the corner of Packard and Bellwood. This home is a three-story 3000 sq. ft. home which was much larger than the first house built by McDowell. In 1926 when Mr. Darling sold the home, it was eventually purchased by Dr. Melissa Worth and her family. Dr. Worth was a general practitioner. She modernized the exterior of the home by adding a second-floor sleeping porch which spans the entire length of the house, a two-car garage, a tennis court, and a large outdoor stone barbecue, which were all luxuries of their times. The home also had several other porches in addition to the one that Dr. Worth added to the home. She was a well respected doctor in this area and many times was called to the Platt School when children were injured playing on the playground. I, for one, fractured an elbow playing "tag" which we all thought was a fun game. After Dr. Worth retired, the home eventually was sold to a couple who lived there and had a business on the third floor called Concept Studios. The area also has a cemetery, which at one time was accessible from Packard Road. Now you have to go down Terhune in Forest Brooke and climb stairs in order to get to it. It is now called Pioneer Cemetery; John Terhune is buried there; he was born in New Jersey in 1759 and moved to Pittsfield Township in 1831, six years before Michigan became a State. He died in 1839. The cemetery also harbors the grave of the first white child to be buried in Washtenaw County. Emily Whitmore lived from 1807 to 1825. The Daughters' of the American Revolution erected a stone wall around the cemetery in 1939; the area surrounding the cemetery was absolute wilderness at one time. See also: Platt School, 1926-195? In the 1920s people started moving from the cities to the subdivisions near Ann Arbor. At that time there were about 200 families living in this area called Mallett Creek settlement and later known as Platt community. Most of the people settled in a cluster at three subdivisions - Boulevard Gardens (roughly the old Platt Farm), Springbrook (roughly the old Nordman Farm), and Darlington (roughly the old Darling Farm). In 1926 these subdivisions became part of Pittsfield Township. This area plus fractions of other school districts made up the 655 acres that formed the Platt School District in Pittsfield Township. In 1926 a temporary building was erected so that Platt school could open in the fall of that year. The Pittsfield Township School District No. 9 had its own school board as designated by the Township Boards of Ypsilanti, Pittsfield, and Ann Arbor. Since the original school had the rooms well filled with pupils, another room was added in 1927. By 1934 a fourth room was added -- financed by WPA Funds; also a basement was constructed under the first and fourth rooms. This school was known as School No. 1; there were nine lots of approximately 3 acres in the School 1 site. Platt School's name was derived from Henry Platt whose farm was east of the school site and the first to be subdivided in this locality. In 1944, the Noble- Grandmont Corp. gave 5 acres on Pittsfield Blvd. to be used as a school building site. This site was then deeded to the federal government for erection of Pittsfield school, which was School No. 2 in District No. 9 Pittsfield Township. 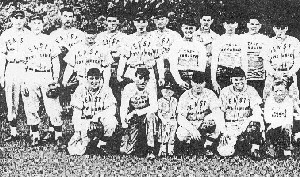 Also in 1926, the first Parent-Teachers' group was organized and many activities began to take place in the area. Some were fundraisers such as father-son banquets, mother-daughter banquets, and the showing of approved movies. There were discussion groups, social meetings, outside speakers, talent nights. These activities, for the most part, used the Platt schoolhouse basement as their meeting place. Annual picnics and school carnivals were well received by all the people in the community. On 2 December 1926, the East Ann Arbor Women's Club became an organized group; they carried on the many activities that the Parent Teachers' group started and added many more. Their name in 1927 was the Platt Willing Workers; then changed to Platt Women's Club; then finally to the East Ann Arbor Women's Club (until many of the club members either moved from the area or passed away). My mother, Emily E. Maury, was very active in this group and the Parent Teachers' group. The aims of this group were both social and benevolent. They would buy small gifts for each patient at the Washtenaw County Infirmary on the corner of Washtenaw and Platt Road (see note regarding Infirmary below). They also raised money from having home talent shows, plays, bazaars, bake sales, bingo, dinners and quilt raffles. Whenever 4-H clubs were organized, the women's club was the sponsor for them. During World War II, they sent gifts and cards to the community boys in service. They also made pads for cancer victims and helped with other charitable work as the need became known to the members of the club. They also had an Honor Roll representing World War II; the Korean Conflict, and the Vietnam War prepared and erected on Platt and Packard; most of the names on this Honor Roll were sons of club members. This was replaced by a memorial stone and dedicated at Scheffier Park at Edgewood and Platt Road on Memorial Day, 1961. The stone was dedicated to all those who were missing or killed in action during the wars and conflict. In addition to the activities sponsored by the East Ann Arbor Women's Club, Platt School directly sponsored the Boy Scouts and Girl Scouts. The Infirmary originally was called the Washtenaw County Poor House and Insane Asylum. Located at Washtenaw and Platt Roads, this was opened in 1837 and operated as a farm on which occupants grew their own food. It was razed in 1917 and replaced by a brick infirmary which was closed in 1971 and torn down in 1979. The Washtenaw County Recreation Center now is at this location. Behind it are the Project Grow Gardens and on Platt Road is County Farm Park; there are 160 acres of woods and grassland, as well as a woodland trail and a pavilion for groups who use the park for reunions and parties. It is a very popular Ann Arbor Park. Since the Platt schools did not go beyond the 6th grade, in the late 30s and early 40s, we were bussed to Ypsilanti Roosevelt School, a teaching school which was part of the normal college (now Eastern Michigan University) or to the old Tappan School (now Burns Park). Later many went to the old Ann Arbor High School (now part of University of Michigan) on the corner of State and Huron while other students continued on at Roosevelt High School. Platt School served as a interdenominational church starting in December of 1926 and Sunday School classes were held there each week. At one time you had to be a member of this Sunday School class in order to hold a Women's Club office. Mrs. Beatrice Hill headed the adult class. However, late in 1928 it was voted to extend membership to any interested women of the community. Ivan Cuthbert, an engineer with a local architectural firm -- and a Baptist, headed services on Sunday mornings. There were about 90 - 100 people including children who attended the services and Sunday School in Platt School. In the early 1940s, other churches began to form in this locality. The Lower Light Tabernacle was built on Nordman Road (now the Korean Baptist Church), the Darlington Lutheran Church on Oakwook (now on Packard Road) and the Calvary Presbyterian Church on Fernwood (which moved from the old building to the new one). A number of other churches now also are in this area. On 2 September 1947, East Ann Arbor was incorporated as a city under Michigan's Home Rule Cities Act. By this time there were about 2000 residents living in this locality who were beginning to need municipal services. We needed fire and police protection, water and sewer lines, and paved roads -- most of which Pittsfield Township could not provide. Our biggest concern was fire protection. By 1950, East Ann Arbor had its own fire station and volunteer fire department. I remember in the early 30s when our home on Nordman Road burned; it was noon hour and the men living near us formed a "bucket brigade" to try and put the fire out before the Saline Fire Dept. arrived. The house was rebuilt and still stands today. In 10 years of being a city, we had 4 unpaid mayors (all prominent men during this period): Robert Harrington is the only one who is still living. He was known as the "flying mayor" as he was an American Airlines pilot as well as mayor and a lawyer in the City of Ann Arbor. In the 1930s there were only two stores in the area of Platt and Packard Road -- plus a gas station on the comer of Packard and Elmwood. McMillan's Grocery and a small Sinclair Oil station was on the Northeast corner of Platt and Packard and diagonal across from it on the southwest comer was Read's Variety Store (groceries plus novelties). In the back of Read's property -- behind the store on Platt Road -- were two gas pumps and one kerosene pump plus an ice house, which is quite rare these days. The gas station on Elmwood was built in the late 30s and was run by Harold Bissell. The former interurban station -- which was on the southwest corner of Packard and Platt in front of Read's store (later Buster's Market) -- served as the City of East Ann Arbor's Administration Building. This building stood across Platt Rd. from the East Ann Arbor Shopping Center which was built by O.R. Beal; by 1947 the center had 4 stores - EAA (East Ann Arbor) Food Market, Lundy Hdwe, W.W. Ladd Dry Goods, and Community Drug. The EAA City Administration Building was sold and removed about 1955 during the time when Harrington was mayor. The interurban station had been built back in the late 1800s. Over the years, it was used for a variety of purposes such as the police dept. office and a barber shop, which was operated by George Hines who sponsored a baseball team for the youths of this area. The Ypsi-Ann interurban railway (as it was called) was completed in 1890 and began operation in January 1891. It originally was powered by steam, but was electrified in 1896. It ran along Packard Road, also known as South Road or the Electric Line Road. The line was extended to Detroit in 1899 and to Jackson in 1902. The line also was extended from Platt and Packard south to the City of Milan via Platt Road. Pilings used by this line still can be seen along Platt Road between Willis Road and Milan Main St. By the end of the 1920s most of the interurban line had gone bankrupt and soon afterwards all the interurban tracks in Southern Michigan were torn up; gone is the era of the interurban lines. One thing to note is that the oldest son of the Nordman family, Emil, was a fireman on the Michigan Central Steam train that left from the Ann Arbor Depot and also was a conductor on the electric interurban railway which passed by the Nordman farm on Packard Road on its journey between Ann Arbor and Ypsilanti. Of all the Nordman's nine children, Frank is still living. He was 98 in May 2003 and still belongs to the breakfast club. His brother, Henry was well-known for making braces, etc. for the doctors at U of M Hospital during the time of the polio epidemic. There were articles written about him in Reader's Digest regarding his expertise in this field. His two sisters and a brother perished in an airplane crash in Isle Royale in Northern Michigan. At the close of the 1949 school year, one of the area's best known educators, Mrs. Mary D. Mitchell, retired from the school system. In her 30 years of teaching and service, 18 of those years were in Pittsfield School District No. 9. A banquet and program were held in May 1949 in her honor at the Ann Arbor Methodist Church where nearly 300 friends and associates gathered. During her years with the Pittsfield Schools, she served as principal and then superintendent of schools. She will always be known for her kindness and a source of great inspiration to the students, parents and teachers of this community. She was one of my favorite teachers; I had her for the second through the fourth grades. The home where she lived still stands on Platt Road. 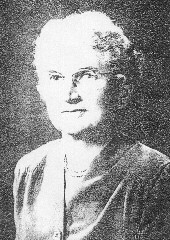 Mary Mitchell had five children (three sons and two daughters), all of whom attended the Normal College in Ypsilanti (now EMU) the same as Mrs. Mitchell had. The new Mary D. Mitchell School was dedicated on 7 June 1952. Later Scarlett School was built in the same area. By this time, Platt School had served its purpose. It closed and eventually became a music store, later a plumbing shop, and finally served as another church -- the Greater Faith Christian Center Church. The members of the Congregation leased the building for about fifteen years, and in 2000 purchased the building and land with the intention of building a new church. Early on a Saturday morning in February 2002, a passerby noticed smoke coming from the building and summoned the Fire Department. The one fatality from this fire was a person who died of smoke inhalation. He was from Waterford, MI, and was here for a temporary medical purpose. He was survived by his wife and small son. This building was a sentimental loss to all those who attended school when it was an elementary school; it certainly will not be forgotten. Another large fire occurred near the corner of Platt Road and Huron Parkway shortly after the Platt school tragedy; only this one was an arson case. This was the 3-story brick United Way Building which also had other offices in it. As I write this, that office building is in the process of being rebuilt. Ironically, as I write this, the Greater Faith Christian Center Church also is being torn down -- to make way for new construction. The volunteer fire department was formed in 1950, and had its own truck and fire station. Volunteers were respected members of the community and made many contributions to municipal affairs. The police department consisted of five officers; one of them was the chief and one a sergeant. Since the police station was closed at night, when one of the citizens needed an officer, they phoned a family who was paid to have the police department's phone ring into their home. The resident would then phone the sheriff's department who would then dispatch one of the East Ann Arbor patrol cars. This resident had to agree to have someone in their house 24 hours a day to answer the phone. The sewer and water were the next items on the list to be undertaken. The sewer system was urgently needed because the surrounding area was swampy ground, which was unable to support the growing number of septic tanks and wells. The estimates for installing the sewer system in the city of East Ann Arbor rose from $233,300 in February 1951, to $345,000 by September 1952, according to the Bentley Historical Library. Construction didn't begin until September 1954 and the sewer contractor went bankrupt due to the fact that the crew kept hitting the underground springs that were located throughout this area. This was the main reason that the costs kept mounting. For one city to annex another requires agreement by voters in both cities. The question was placed on the ballot on 6 November 1956; it passed in Ann Arbor 3 to 1 and in East Ann Arbor 2 to 1. East Ann Arbor was then annexed by the City of Ann Arbor despite the fact that the sewer system still was not completed. Besides a change of name, some of the streets also had to be renamed because of duplication. Today's Redwood previously was Lafayette; today's Wolverine had been Washington. The sewer was completed, and city water replaced the well water which in many cases had to be replaced periodically anyway -- as the wells in most cases were shallow wells. The other thing that attracted the voters besides the sewer and water was the fact that the home insurance rates would decrease when the homes were serviced by Ann Arbor's full- time, fire department. The Cuthbert home on Platt Road was built in 1921. Cuthbert also had several lots on Elmwood as well as Platt Road where he raised South American chickens - Araucana - which laid colored eggs (mostly pastel colors). People would go to his home to purchase eggs for Easter. When East Ann Arbor became part of Ann Arbor, his property remained an island in Pittsfield Twp. until his death. An article about him appears in the September 1948 issue of National Geographic, which featured his chickens as they are quite rare in this area. After his death, all of his property became part of Ann Arbor. Mr. Cuthbert was a well-known engineer with an architectural firm that maintained offices on Huron Street in Ann Arbor. He and his wife had 4 children -- two sons and two daughters. Today, this is a diverse area with people of many races, well- kept homes and manicured lawns, many flowers in gardens and in pots on the front porch, and paved roads. But I still miss the country style of living with backyard gardens, children's play toys and the wild animals which frequented my backyard at night or during the day -- the woodchucks, the racoons, the pheasants, rabbits, and, yes, even the skunks. They all seemed to think my backyard was home to them. The noise from in front of my home -- with the swish of traffic and the blare of car horns -- is entirely different from the backyard of my house, even today. My back yard always reminds me of those days that have passed -- along with East Ann Arbor.